High-speed LAN-to-LAN connectivity between two enterprise locations. 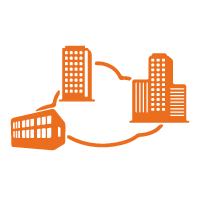 Connects multiple enterprise locations together in a private any-to-any LAN that extends throughout, and beyond, the metro area. Exceptional reliability: Reliability of the network is unmatched due to our low-latency core ring configuration designed to be more dependable. Network Redundancy: Less than 50 millisecond failover in the event of a fiber cut. Best-in-class Service Level Agreements (SLA): Let us show you the difference! Superior security: Experience a true private network, which inherently creates a much more secure solution than an internet-based Virtual Private Network (VPN). Guaranteed scalability: Our solutions are flexible and can scale with all of your growing business demands.